Every week, we like to pick a “themed” meal based on who either the Ohio State Buckeyes or the Cleveland Browns are playing. A couple weeks ago, the Browns were playing the Jets, so we decided on Italian food. I loved how easy this was compared to making a huge tray of lasagna which is significantly more time consuming. And, this turned out to be exactly the kind of warm, delicious dinner we were looking for. I even took it for lunch the next day and since leftovers are typically not my favorite, that’s saying A LOT! Place a large cast iron or non-stick oven-safe skillet with a lid over medium heat. If using ground beef, cook, stirring occasionally, until no longer pink. Then remove the ground beef from the pan, drain any grease, and heat the olive oil still over medium heat. If using Italian sausage, heat the olive oil over medium heat (you’ll cook the sausage later). Add onion, salt, and pepper to pan. Cook, stirring occasionally, until the onions have softened about 5-7 minutes. Add in the garlic, red pepper flakes, and Italian seasoning and cook 30 seconds until just fragrant. If using Italian sausage, add it to pan now and cook, stirring occasionally, until no longer pink. If using ground beef, add it back to the pan now. Scatter the lasagna noodles in the skillet, and pour the tomatoes with their juices over top of the noodles. Increase heat to medium-high and cover. Stir it often at a strong simmer until the lasagna noodles are al dente, about 20-24 minutes. Preheat your broiler. Once the noodles are al dente, remove the skillet from the heat, and stir in half of the mozzarella and Parmesan, and ¼ cup of the ricotta. Dot remaining ricotta over the top, and sprinkle the remaining shredded cheeses in an even layer. Place in the oven and broil until cheese is slightly browned and bubbling, about 5 minutes. Take it out of the oven, sprinkle with basil, and serve. This looks so yummy. It would be great to make for a poker party! I LOVE your new website design!! 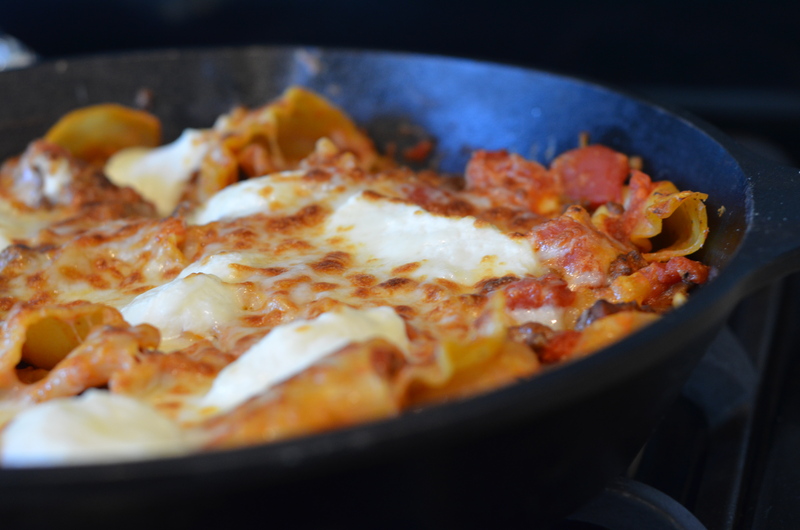 That skillet lasagna looks so wonderfully appealing! !